The BENAUDIRA – auditory training trains the central auditory processing. The way from the sound in the outside world to the perceived sound in the brain comprises several steps. At first the sound reaches the outer ear and passes the external auditory canal. Then it gets to the eardrum and into the middle ear. From there it is transferred to the inner ear where it is translated into nerve impulses. Those nerve impulses get through the auditory nerve to the brain and are processed there. The whole chain of hearing has to function properly so that e.g. speech sounds can be recognised and differentiated in an optimal way. If there is a problem at one point of the forwarding, however, also the processing of the heard sound can be impaired. If these problems are located in the area of the middle and the inner ear, they have to be clarified by an ENT doctor and be treated when indicated. Even if the ears are functioning normally, the central auditory processing can be impaired. This impairment can be that the person hears all in all not loud enough. It can be also the case, however, that single pitches (frequencies) are heard to sensitively and other frequencies in contrast not sensitively enough. The heard sound is than processed in an unbalanced way. Furthermore, it is essential for an optimal auditory processing that the collaboration of the two brain hemispheres is harmonic. If this is not the case, no dominant ear is pronounced or both ears switch in laterality from one side to the other. The heard sound can then be perceived with delay or mixed up in the order. BENAUDIRA provides the possibility to improve the central auditory processing concerning these aspects. 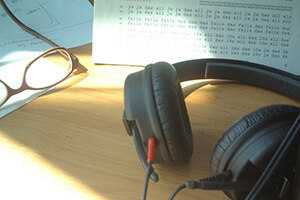 The basis of the auditory training is a collection of instrumental music, vocals, speech and sounds that has been developed specifically for that purpose by Holger Raddatz (in cooperation with specialists of different forms of therapy). For each affected person, an assortment corresponding to the individual problems is compiled. In the frame of an examination, different tests for the evaluation of the hearing ability are performed. On the basis of the results achieved, a training-CD exactly designed for his needs is produced for each user. The CD is heard several times per week at home for 10-20 minutes, respectively, with customary headphones. After 6-12 weeks, another test is carried out at the therapist. Subsequently, a stimulation-CD adapted to the current situation is produced. All in all, the training consists of 3-5 of these cycles.